Monday and yesterday, Kaleb stayed home from school. He caught my cold. Poor thing. I picked it up at Sally's a couple weeks ago. When I showed the lady how long my hair was, she suggested I would need three jars. I only needed one and a half. I asked if I would only get that color if I bleached my hair first. 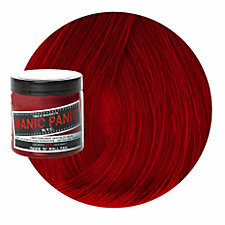 She said that it would help, but it would still be really red even if I didn't. She also told me to leave in on for two to five hours instead of the thirty minutes on the jar. I didn't want to bleach my hair, so I just worked with what I had. 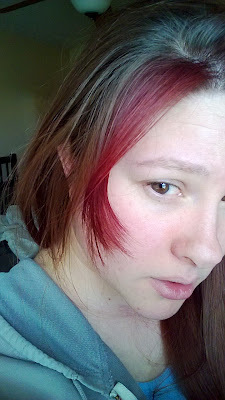 The problem with red hair dye is that it doesn't last, and this is a semi-permanent hair color. Which means it will fade out as I was my hair. I think this is why I was reluctant to do it before. But my director told me my character is eccentric and that having red hair would be great for her. 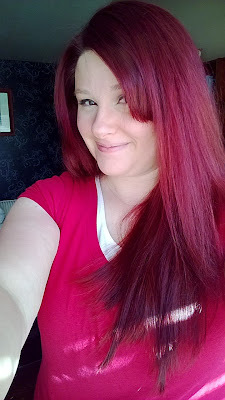 So I said that I wanted to do it really, super red. She said that would be fine. I showed her the dye and she said, "You don't have to do it that bright if you don't want to." Oh, I want to. I assured her. I really have always wanted to, but this play has given me the excuse I needed to do it. Finally! And nobody was there to talk me out of it, either (yes, that has happened before, but this person is not in my life right now. To be fair, though. I've talked myself out of it plenty of times). Here is the before picture. Taken Monday. 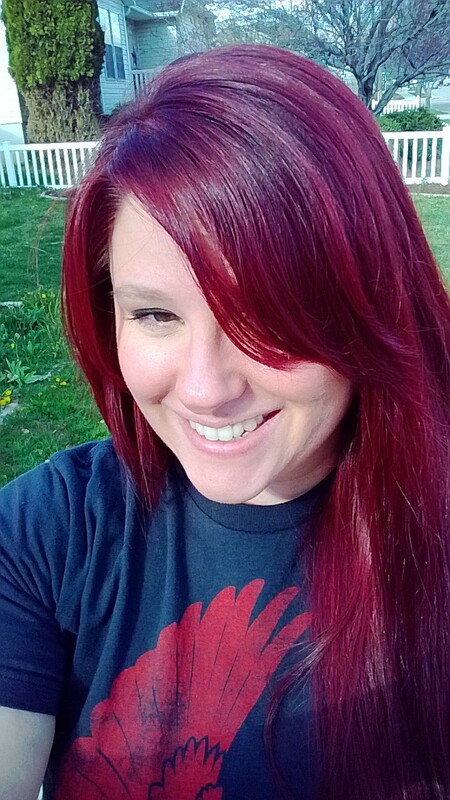 I dyed my hair red in February. 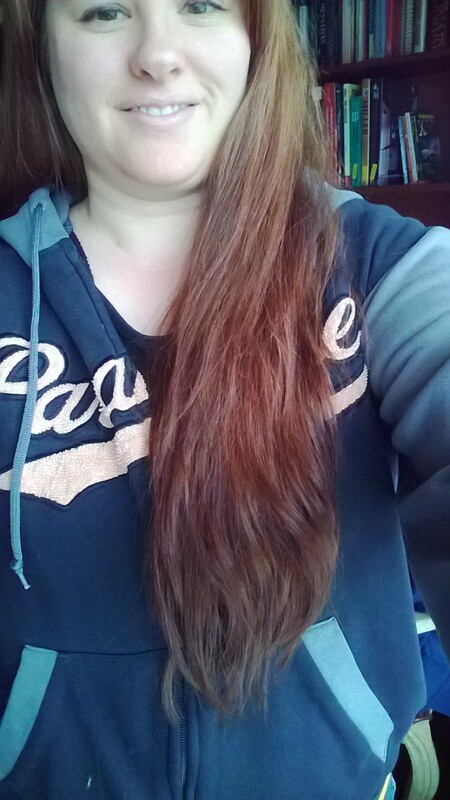 It's faded quite a bit since then, and my roots are getting bad. I just wanted to show you how long it was, too. I did a strand test to see how it would turn out. I loved it. Kaleb said it was cool. I said, "Should I do all of my hair this color?" He laughed like he didn't think I was serious and said, "Naaaahooooh!" I said, "Yes, I'm going to!" 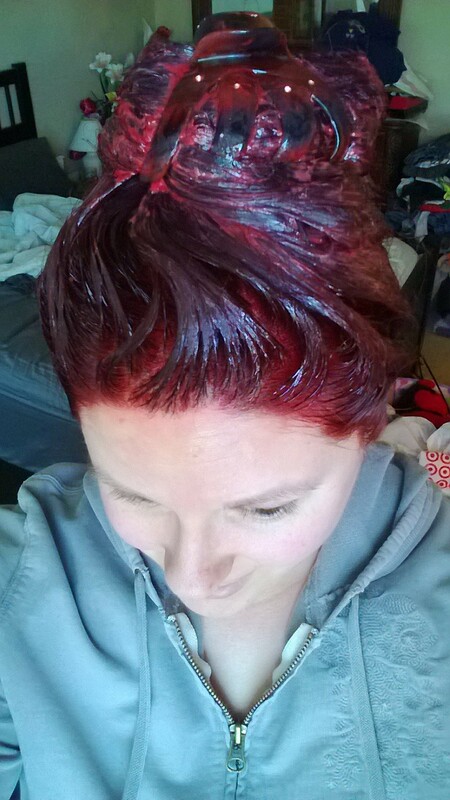 He giggled some more, and I went and gooped up the rest of my hair with the dye. Here is the final result! I love it! I showed up for rehearsal last night, and my director loved it! So did everybody else in the cast. Sweet Pea said I looked like Ariel. Awesome. Ariel is so cute. Maybe a little crazy, but still fun to be around. ;) She also said when she first saw me, she thought it was the stage lights. Sometimes they light up your hair funny and put blue tints in, or purple even though they aren't there. Ha ha! It's awesome. I love having this excuse to do something crazy that I've always wanted to, but sometimes wondered if I was too old to do. With a new color, I figured I needed a new cut, so I contacted my friend and she cut my hair this morning. 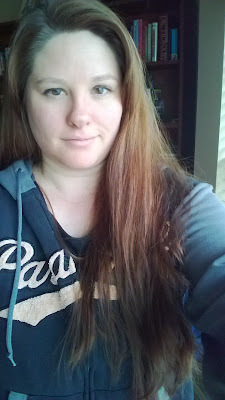 I think we cut off four or five inches and she added a bunch of layers. It was soooo nice, though! I haven't had a haircut since my sister's wedding (I just haven't had the time). So here it is, the new cut and color! Did I mention that I love it? OH AND DEATH BY CHOCOLATE OPENS FRIDAY, APRIL 19th! IT RUNS MONDAY, FRIDAY, & SATURDAY UNTIL MAY 11th! GET YOUR TICKETS NOW! CLICK HERE FOR BOX OFFICE INFORMATION! I love it too. Good job!! That really is cool! I love it!